With 37,000 nautical miles of a unique corporate adventure under their belts, the corporate staff of De Lage Landen, a global provider of asset-based financial products, is about to set off on the final New York to Southampton, England leg of the Clipper Round the World Race. DLL staff members from U.S. headquarters in Wayne, and from offices in Duluth, Ga., and Des Moines, Iowa, will be in New York on the June 7 sailing date to honor the crew and cheer as they head across the Atlantic. The unique corporate adventure connects nearly 5,400 staff members worldwide. Not only is DLL the first corporation to enter the Clipper Round the World Race, it is also unique in having its own employees on board. DLL wanted to do something different and provide a team-building exercise for the worldwide staff. Of the more than 160 DLL staff members who applied as crew, eight are making the journey after passing the rigors of boot camp and intensive training. They are from Australia, Brazil, Canada, Poland, Spain, Sweden, the United Kingdom, and the United States. 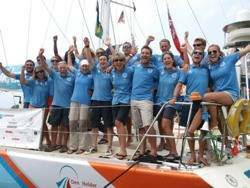 Highlights of the journey have included Team DLL's first place in the Singapore to China race, and their medical assistance earlier in the race to another clipper. Individual DLL staff and offices have also used this opportunity to support conservation of fragile ocean ecosystems through a number of creative fund-raisers. Their efforts are benefiting the World Wildlife Fund's protection of the Coral Triangle.